LIVE DEAD, a stunning 224 pg. hardcover coffee table book spanning almost 40 years of epic Grateful Dead photos and stories by Bob Minkin. Signed and personalized by Bob Minkin. Signed and personalized by Bob Minkin. Add personalization details if desired during checkout. 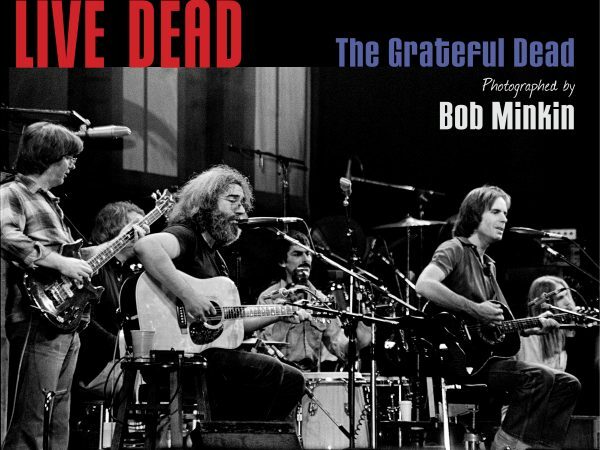 In addition to live concert images, LIVE DEAD features intimate backstage shots, photos of the the tour scene and even inside the Dead’s legendary Vault. Included are behind the scenes stories of many of the images I captured and tales from the road — experiences every Deadhead can relate too. The post Grateful Dead years are also be represented, including Furthur, Phil Lesh & Friends, Ratdog, and the current musical renaissance now happening in Marin County with Terrapin Crossroads, Sweetwater Music Hall and Bob Weir’s TRI Studios. LIVE DEAD: 224 pages. 12″ x 9″ Hardcover, beautifully printed. If every Dead Head could assemble their own personal dream photo album/scrap book, it would look like this book. You can feel the energy jumping from this volume, both by what the lens has captured on one end and what the photographer felt on the other end. And it is home, for many of us. Amazing photos. And a great coming of age story as Bob Minkin goes from high school shutterbug and print peddler to maccomplished artist and professional photo-historian. One who made it thru and over the wall into the world of the Dead to share with those of us who would only dream of the places he has been and images he has brought home for us. …..in a sea of works about the Grateful Dead there is new light shed here. A rare and different tune !! This really is a fantastic book. Bob’s pictures are amazing. There are a lot of great pictures from the 12/29/77 -12/30/77 Winterland run. I always dug Jerry’s style in the 70’s. There were tons of pictures I never saw before. Any Dead Head would be happy to own this book. Well worth buying. Fantastic top-shelf quality collection of Bob Minkin’s GD photos. He Was There with film loaded and a great eye for framing. Nice!